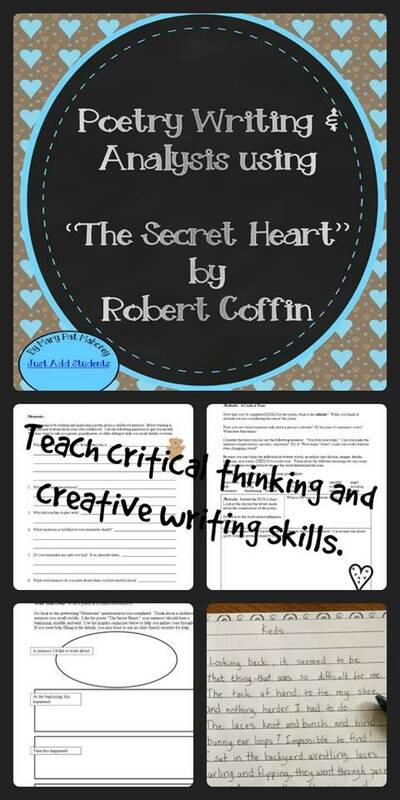 Teach critical thinking, analysis, and creative writing using the poem “The Secret Heart” by Robert Coffin. This delightful poem tells the story of a childhood memory a son has about his father. This resource will guide your students’ understanding of the poem by using the TP-FASTT and DIDLS analysis acronyms. The analysis tools are broken down in easy-to-follow activities – including practice scanning the poem. “The Secret Heart” is widely anthologized. It is not in the Public Domain, so I haven’t included a copy of the poem with this lesson. It is available through online and print sources.